Networking has certainly become important to our daily life. Whether light-hearted interaction with friends or communicating with business clients the world over, socializing is integral to our personal and professional relationships. Facebook has gotten most of the buzz in the past few years, allowing members to easily stay connected with friends, family members and business associates. Adding friends, sending messages, chatting, joining causes and networks for your institution or workplace, you can do it all here. Here, we’ll introduce you to 20 scripts that are typical for the Facebook user experience. Web designers and developers who want to integrate Facebook-like features into their websites and applications are in for a treat. A lot of lightboxes are out there, but why not make the perfect one, like the one on Facebook? This great lightbox script was created by famspam. Writing code for even routine tasks can be cumbersome. But with the simplicity of JQuery, you can have a lightweight Facebook-style lightbox for your website. Capable of displaying DIVs, images and even entire remote pages, the lightbox creates pop-ups that are visually appealing and easy to use. You can get started here. Download this Facebook-inspired auto-suggest search feature here. A major hit on Facebook, this jQuery plug-in is now counted among the most functional UI effects on the Internet. This elastic plug-in automatically shrinks or expands text areas according to the amount of text inputted by the user. The weight of this plug-in is what gives it its edge over competitors. Now, you can recreate this impressive Facebook-style effect of an elastic text area by simply following this tutorial. Wondering how to make a relevant tooltip pop up as users move their cursor over the title attribute of an anchored tag? 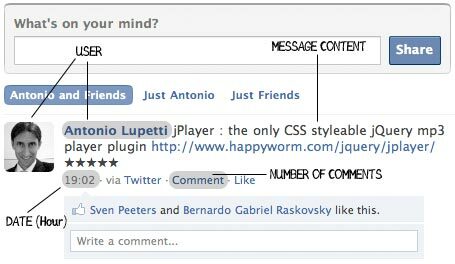 Facebook provides inspiration for this jQuery plug-in, and you can implement this cool tipsy plug-in on your own website now. Aside from being a neat trick, the plug-in is easy to configure and lightweight. Read the tutorial to learn how to incorporate the Tipsy plug-in on your website. This innovative plug-in for Movable Type 4.1 allows you to share, control and aggregate all of your activities around the Internet, along with several of your profiles from different services. The plug-in emulates the Facebook streams that adorn your wall. So, if you have a Movable Type blog and wish to exercise complete control of your activities on the ‘net, including showing or hiding certain activities, this tutorial on Facebook-like activity streams is sure to be a great help. To keep you from being locks in to any particular service, this plug-in can also publish your stream with the hAtom microformat and Atom. Chatting with friends online is fun, but words are sometimes not enough to convey our feelings. Icons come in handy because they’re a cute, simple way to express emotion. Of course, saying “I love you” has a powerful effect, but an icon of a little heart pumping is so much more stylish. Facebook icons are a hit among users, and you can download 28 of them here, for free. They are available in SVG and high-resolution PNG format. Website developers are constantly looking out for great ideas with which to enhance their websites. The slider controls on Facebook have caught the eye of many professionals. To implement similar-looking sliders for your project, read the tutorial here. It explains how to create them and how to control the height, width and opacity of images. The credit for this easy three-slider tutorial goes to David Walsh, a successful Web developer in his own right. Hats off! Having to switch between two websites every few seconds — or even few minutes — can be annoying: for example, to chat with a friend on Gmail and browse photos on Facebook. With that in mind, Facebook took social networking to the next level when it integrated chat functionality. And now you can integrate a similar feature on your Joomla website using this tutorial. The distinctive name of this application is taken from the Hindi word “bolo,” which means to talk. So, get to work and let your visitors start talking! Styled like the dialogue box on Facebook, this flexible box supports size tweening and dragging. What distinguishes Boxy from several other overlays is the availability of an object interface to control dialogues after creating them. To make usage even simpler, it also provides you with a jQuery plugin that allows you to include forms and links automatically, along with the “Ask helper” to present the user with an array of choices. Read the tutorial to implement the Boxy dialogue box on your website. Everyone loves Facebook’s chat module. And this jQuery module lets you seamlessly integrate Gmail- and Facebook-style chat into your website. This chat script has many features, such as keeping chat boxes open and preserving a box’s state (and data) even when the page has been refreshed, just like on Facebook. Also, this chat is extremely simple to integrate. Learn more about this Facebook-style jQuery chat. It happens often enough that while performing a particular action, we lose focus and mess up the task. Alert confirmation boxes can be a great help here. In asking for your confirmation of an action, the box makes you think through your request before finalizing it. For instance, to remove a friend from your friend’s list on Facebook, you need to click on the “X” button, which brings up an alert confirmation box asking you, “Are you sure you want to delete so-and-so from your list?” You are given the option of “Yes” or “No,” which finalizes the action. Alert boxes can help visitors to your website complete important actions, such as deleting items from a shopping cart. This tutorial shows you how to make an alert confirmation box like the one seen on Facebook. Designing Facebook-style pagination to break up a long list of search results into several pages is no longer a difficult task. Though page numbers are not displayed at the top of Facebook, you are given the option at the end of the page to see more results. To create a similarly subtle yet helpful feature on your website, go through the tutorial here. This is the best script for inline chat similar to the kind seen on Facebook. Get the script to give your visitors a chat environment to interact in while they browse your website. They can also update their status, like “Available,” “Busy,” etc. Facebook-style AJAXification ensures the feature does not reload every time a visitor clicks to another page. Hash URLs and notifications in the footer are some of the other features integrated in Cometchat. Integrated with the auto-complete function, the input box on Facebook allows you to search for and send messages to your friends. To include a flexible Facebook-inspired input box for your website, just grab this MooTools 1.2-compatible script and get started. Does the instant messenger and chat room on Facebook make you green with envy? Give your website the same with this Joomla module. Visitors can sign in to the messenger with their Facebook ID and password and use their friends list from Facebook. It really is as simple as that. Isn’t it great that you can share what’s on your mind with all your friends in an instant, and vice versa. These status updates are one of the main features of Facebook. And below them is room for your friends’ comments and a option to “Like” your status. This feature is referred to as “vBStatus,” and you can include the same on your website by downloading ithere. Users will have the flexibility to quickly change their status whenever they want using AJAX. Facebox is lightbox script that gives you the look of Facebook pop-up message windows. It can contain images, Flash movies, HTML and more. Facebox is a MooTools alternative to the original Facebox jQuery script. Read more about Facebox here.